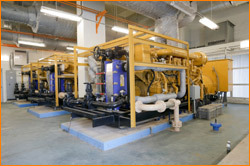 All of the fluids in an emergency power system need to be tested on a periodic basis for any changes. The changes are due either to use of the equipment or to natural changes related to the chemistry of the fluids or to both. The condition of the fluid tells us about the readiness and capacity of the equipment to perform its job. 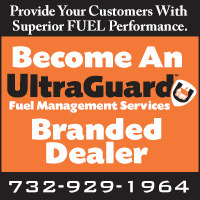 The fuel is critical to the reliable performance of the equipment. Today's diesel fuel is much more chemically active than the refined products of just a few years ago. Diesel fuel is not only subject to water, microbial degradation and outside contamination, but also to natural degradation due to oxidation and repolymerization. Repolymerization is a process describing the formation of insoluble gums and particulate generated by the fuel primarily as a result of refining procedures used to produce diesel fuels from heavier petroleum hydrocarbons. 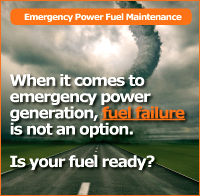 Fuel can be stored and relied on indefinitely if maintained properly. Lubricant condition can tell us about the equipment as well as the lubricant. Wear metal analysis, fuel dilution and antioxidant content are examples of testing parameters that can guide us to efficient oil changes and equipment maintenance that can yield reliability in a cost-effective manner. The coolant can be conserved and maintained in a reliable condition if tested and maintained regularly. Our experience and procedures for maintenance for Emergency Power Equipment date back to 1955, when the founder of International Lubrication and Fuel Consultants, Inc., George Kitchen, became the supervisor of the Fuels and Lubricants research laboratory of AT&T's Bell Telephone Laboratories. For 27 years George wrote the Bell System Practice for the condition monitoring of emergency power equipment. In 1982 George founded ILFC, Inc. to bring his capabilities to the regional companies at the breakup of AT&T, as well as to other users of emergency power equipment. ILFC has several patents on the testing of middle distillate fuels and chemical additives to assure that today's fuels do their job. ILFC is the only company to provide a fuel oil stabilizer to meet the stringent standards of the US Navy. Today ILFC provides testing and additives in support of thousands of emergency power locations, including telephone companies, hospitals, retail businesses, banks, utilities and more. Fuel Management Services, Inc. with its network of distributors and business partners, provides ILFC with distribution for its specialized laboratory services and products. We are the hands and feet for their sophisticated laboratory. Fuel samples should be free of contamination from tank bottoms. Samples should be pumped from above the fuel/water interface. This level can be determined by coating a dipstick with water-finding paste to a point 6" above the tank bottom. After the depth of water has been determined, attach the flexible hose from your vacuum pump to the dipstick so the sample will be collected well above the water level. Samples should be collected on a semi-annual or annual basis based on priority of the location. Samples should be packaged for lab shipment following guidelines provided by carrier. During the sampling process the amount of water and sludge should be carefully noted. If significant water and sludge is present, arrangements should be made to remove them. Tank integrity should be assured if the amount of water present is more than can be justified as condensation. Tests will determine if preventive maintenance doses will suffice or if treatment doses are necessary.